An unmistakable and improbable-looking bird. For me, one of the best parts of going to Florida for the Space Coast Birding and Wildlife Festival is the chance to see Roseate Spoonbills. 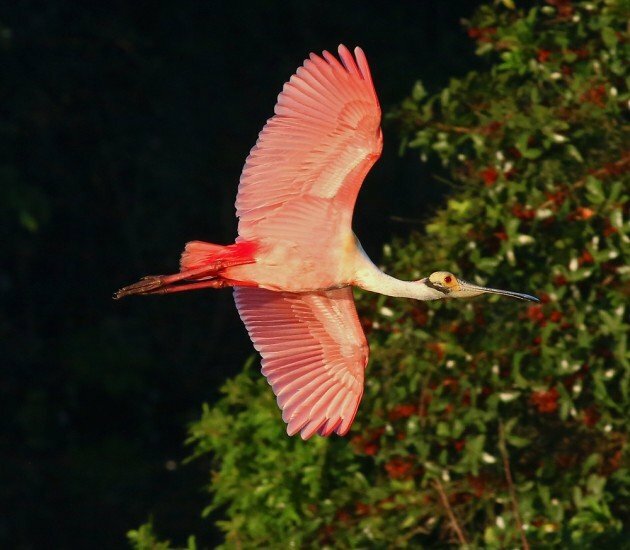 Ever since I saw my first spoonbill, a vagrant in New Jersey, I have been a bit obsessed with the big, pink, bizarrely-billed birds. Three years ago I shared a gallery of images of spoonbills at Merritt Island National Wildlife Refuge but I think it is time for another. You can never get enough spoonbill! 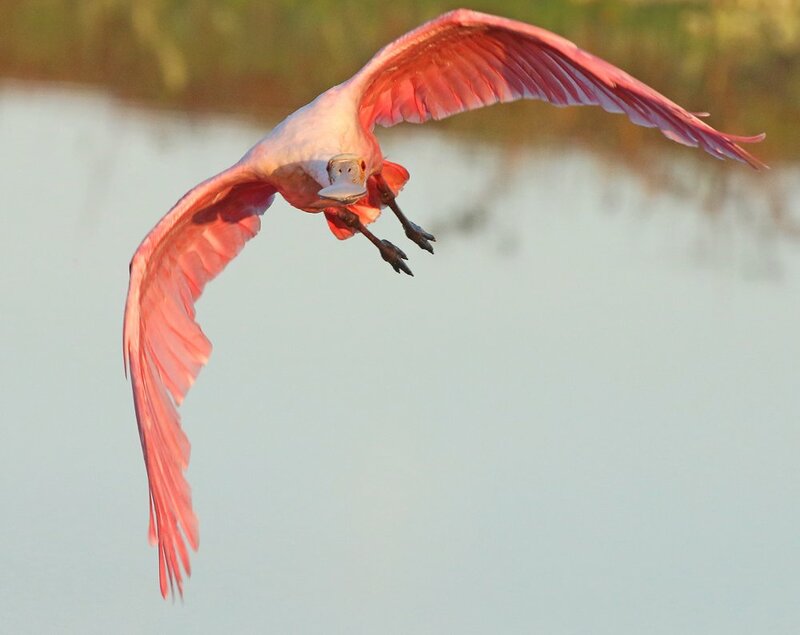 These photos were all taken during the 2015 Space Coast Birding and Wildlife Festival at Biolab Road and T. M. Goodwin Waterfowl Management Area. I think that this gallery far surpasses what I managed to do three years ago and I hope you agree! All of these images have bigger versions available if you click on them. Early morning light on a Roseate Spoonbill is awesome. So is a spot where they predictably fly around, like the entrance of T. M. Goodwin, where this shot was taken. I spent twenty minutes just enjoying the spoonbills before tearing myself away. 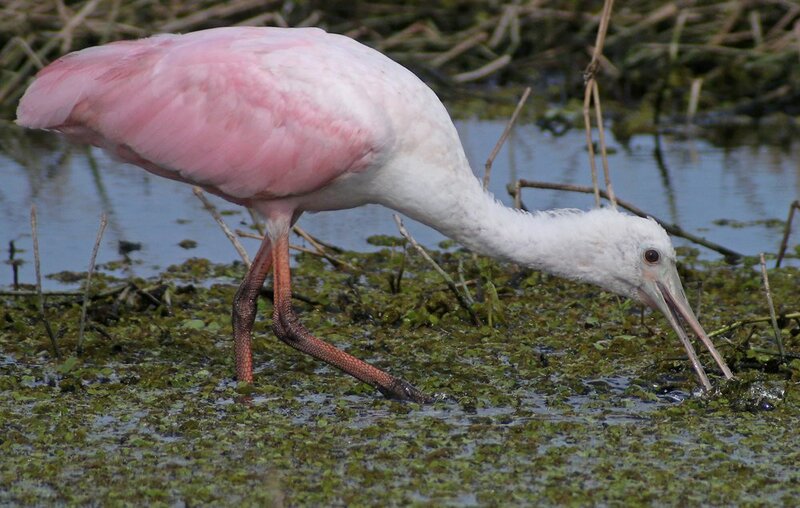 This young bird was one of dozens of spoonbills feeding in the north impoundment at T. M. Goodwin. 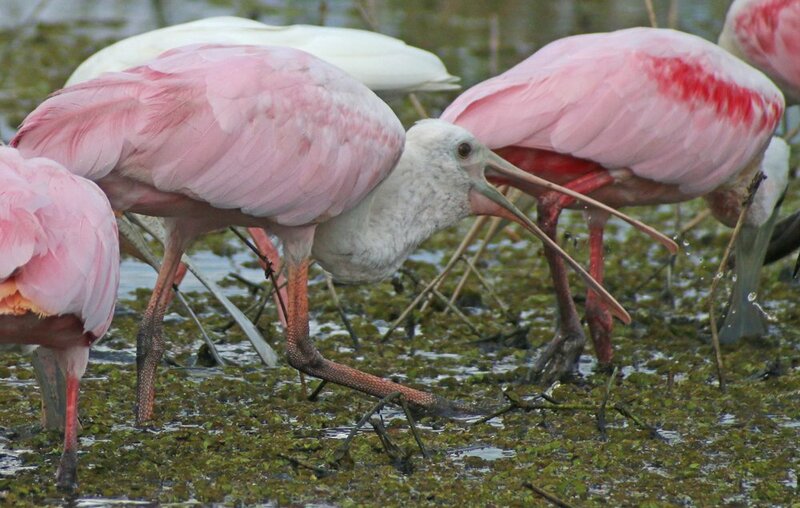 Though spoonbills like feeding with their own kind they are often joined by egrets and ibises. 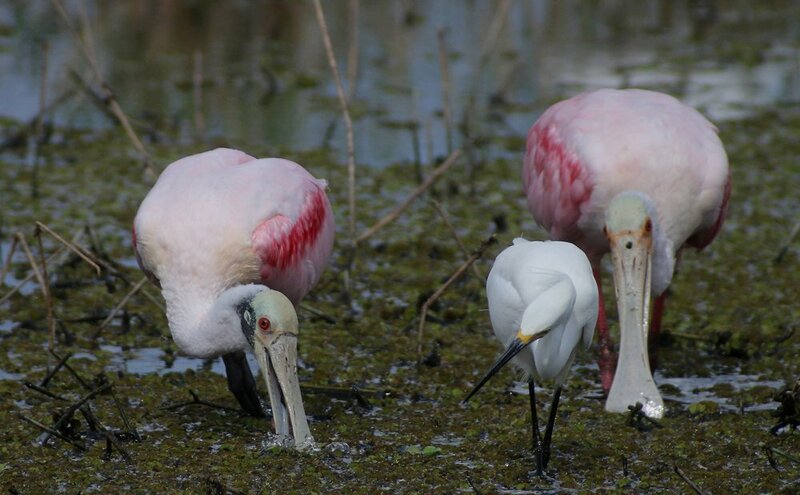 Here a Snowy Egret joins the spoonbills. Success! 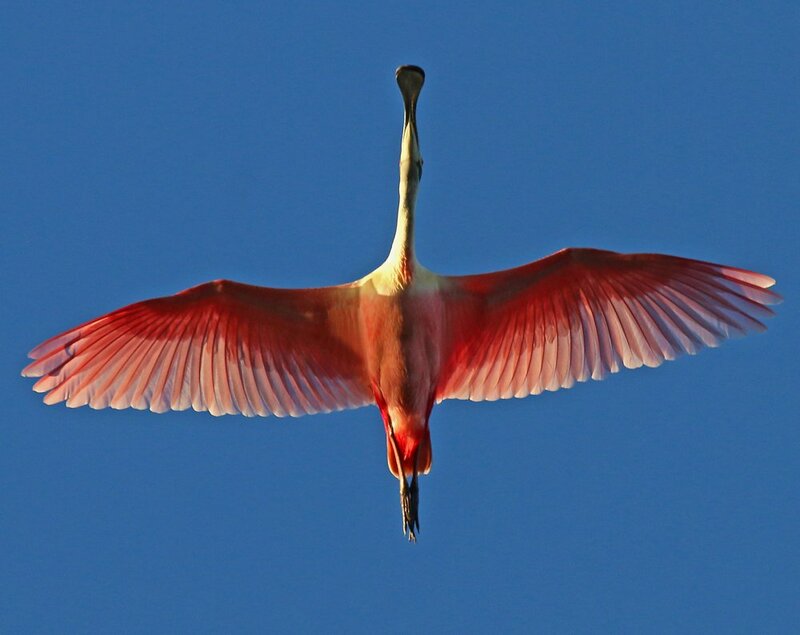 This young Roseate Spoonbill is tossing its catch into its mouth. After a raptor spooked the spoonbills a whole bunch flew to this machinery. I took a couple of quick pictures and then raced to get around to the other side where the light would be better. Unfortunately, a woman with an iPhone had the same idea and she walked to close, flushing every single bird. Such are the trials and travails of being a big, pink bird. Irresistible! Biolab Road in Merritt Island National Wildlife Refuge is a great place to see spoonbills in flight at the end of the day. Sometimes, you get lucky and they literally fly directly over you. 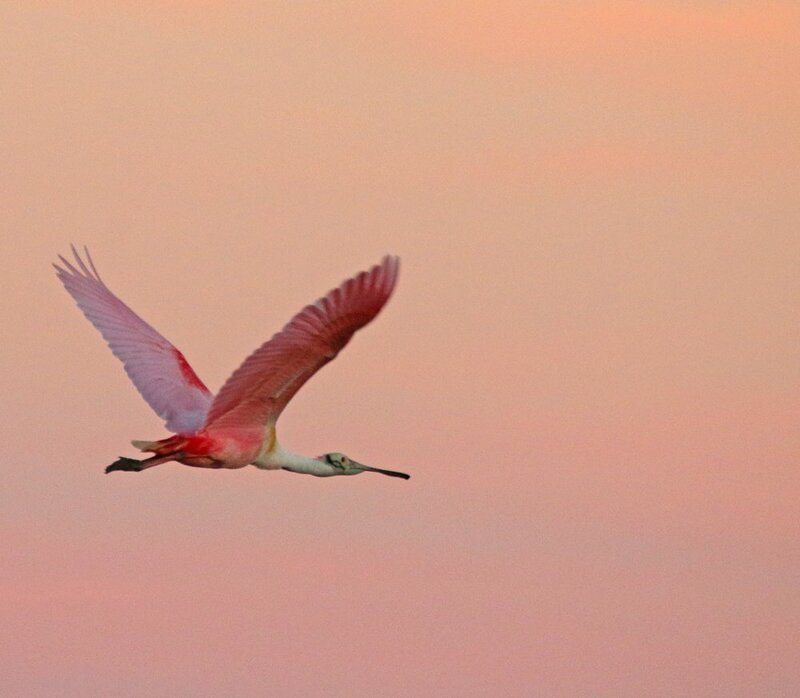 Can anything beat a pink bird against a pink sky? I doubt it. If you liked these images of Roseate Spoonbills and want to see more great images of birds make sure to check out 10,000 Clicks, our big (and growing) page of galleries here at 10,000 Birds. And you could have corrected this issue in your comment but you failed. I’m disappointed, Jochen. Thanks so much, Corey, for being so very kind to my friend Roxanna and me, when you set up your fab scope just for us to see these amazing birds in detail. This was on BioLab Rd. And thanks, too, for the encouragement to get going before the gate closed (early). You were so right! We got there in the nick of time. 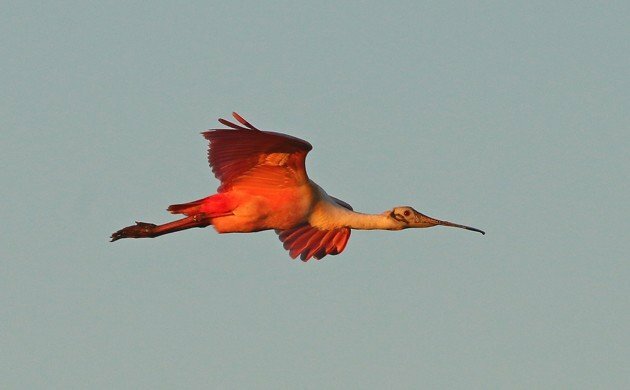 there’s been a Roseate Spoonbill at the Salton Sea (southern CA) for the past two weeks or so! Great post! A Roseate Spoonbill in Mexico was one of the reasons I got interested in birds.